An intracranial dural arteriovenous fistula (dural AVF), also known as a dural arteriovenous malformation, is a type of intracranial vascular malformation. A dural AVF is a connection between an intracranial artery and a dural venous sinus. The current treatment strategies for dural AVFs include microsurgical ligation, transarterial or transvenous embolization, stereotactic radiosurgery (SRS), and various combinations of these options ,,. There are two major classification systems for dural AVFs according to the location and drainage of the fistula, the Borden classification and the Cognard classification ,. The Cognard classification can be merged with the Borden classification according to cortical venous drainage [Table 1] . Carotid-cavernous (CC) fistulas, which connect the internal carotid artery and a cavernous sinus, have their own classification system. 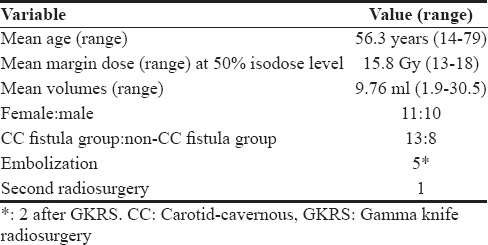 These fistulas are classified using the Barrow classification according to high-direct fistula flow or low-indirect fistula flow and the location of the fistula [Table 2] . Barrow Type A CC fistulas are defined as high flow, with direct drainage from the internal carotid artery to a cavernous sinus, and are related to trauma; this type of fistula is beyond the scope of this study. In this article, we evaluate the initial presentation, clinical course, and outcome of dural AVFs at our hospital. Gamma knife radiosurgery (GKRS) is the major treatment modality for dural AVFs at our hospital because of patient preference, embolism technique limitations, and physician preference. Therefore, this article can serve as a reference for those interested in dural AVFs treated using GKRS and other SRS techniques. Patients enrolled in this study included those diagnosed with dural AVFs between 2004 and 2014 at Tzu Chi General Hospital, Hualien, Taiwan. Patients who did not have dural AVFs confirmed through angiography were excluded from the study. The study was conducted in accordance with the Declaration of Helsinki and was approved by the local ethics committee of Tzu Chi General Hospital, Hualien, Taiwan. (IRB 103-88-B) Informed written consent was waived because the study was a retrospective data analysis. The data collected included gender, age, initial symptoms, type of dural fistula, treatment strategy, radiosurgery dose, volume treated using GKRS, imaging results, length of patient follow-up, and outcome. Complete obliteration (CO) was defined as no dural AVFs observed on either magnetic resonance imaging (MRI) or angiography during follow-up. Partial obliteration was defined as regression or decreasing of dural AVFs nidus or venous drainage on MRI or angiography, mainly defined by the radiologist. Partial symptom resolution was defined as decreasing symptoms including tinnitus, proptosis, or chemosis according to patient report and physician observation. The treatment to image-free duration was defined as the duration between the patient receiving radiosurgery and CO confirmed through imaging. The treatment to symptom-free duration was defined as the duration between the patient receiving radiosurgery and the time at which the patient became symptom-free. After local anesthesia had been applied, a Leksell stereotactic frame (Elekta Instrument AB, Stockholm, Sweden) was rigidly fixed on the patient's head, following which digital subtraction angiography images and contrast-enhanced brain MRI (1–2-mm thickness) were acquired. These images were sent to a GammaPlan computer (Elekta Instruments AB, Stockholm, Sweden) and the region of interest was planned [Figure 1]. A 201 cobalt-60 source gamma knife system (Model C, Elekta Instruments) was used. After complete planning, the patient's head and frame were fixed in a collimator helmet and the treatment was performed until the conformal field encompassed the treatment volume. For dural AVFs, the treatment dose ranged from 13 to 18 Gy at an isodose level of 50%. The dose was determined on the basis of the target volume (the larger the volume, the smaller the dose) and whether critical organs (e.g., optical apparatus or brain stem) were near the radiation target. For abnormal AVFs which drained into the sinus wall, the target was along the involved sinus wall . Arterial feeders and cortical drainage veins were not considered treatment targets. SPSS 18 (IBM Corporation, Armonk, NY, USA) was used as the statistical analysis tool. Univariate categorical analyses were conducted using the Pearson Chi-square and Fisher's exact test. Univariate continuous variable analyses were conducted using Student's t-test. Kaplan–Meier survival analysis was used to calculate the treatment to symptom-free and treatment to complete image-free durations. A value of P < 0.05 was considered statistically significant. The median follow-up was 70.5 months (range 3–136 months). Thirteen of the 21 patients treated had Borden Type I and 8 had Borden Type II/III dural AVFs (Borden II =7; Borden III =1) [Table 3]. The cavernous sinus was the most common location of dural AVFs (13 patients), followed by the superior sagittal sinus and the transverse sinus [Table 4]. Thirteen patients had CC fistulas and eight patients had non-CC fistulas. The average dose applied was 15.8 Gy (range =13–18 Gy). The average treated volume was 9.76 mL. Patient's age ranged from 14 to 79 years (mean: 56.3 years). A pulsatile bruit was the most common initial symptom [Table 5]. Five patients underwent embolization (2 after gamma knife) and one patient received a second radiosurgery [Table 6]. Four patients did not have follow-up images and thus were excluded from the CO rate calculation. The CO rate was 47%, and the partial to CO rate was 88%. The complete symptom resolution rate was 77%, and all patients achieved partial to complete resolution of their symptoms [Table 7]. The CO rates for non-CC fistulas and CC fistulas were 66.7% and 62.5% (P = 0.347), respectively. The CO rates for Borden Type I and Borden Type II/III dural AVFs were 66.7% and 25% (P = 0.153), respectively, and the complete symptom-free rates were 76.9% and 75.0% (P = 1.000%), respectively. The median duration between initial GKRS and complete symptom resolution was 14.3 months. 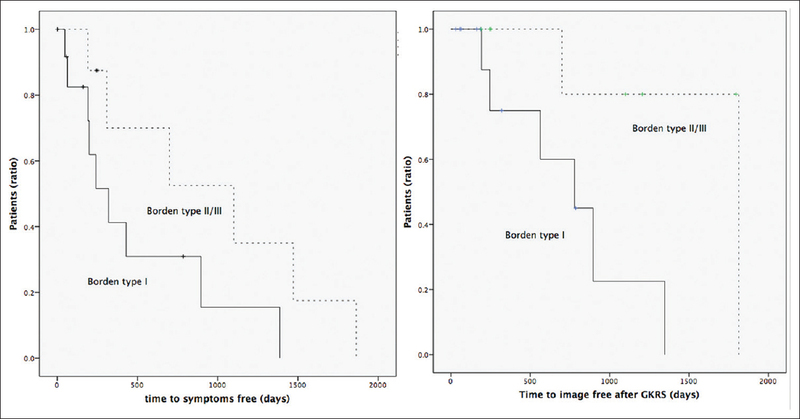 The median treatment to image-free durations for Borden Type I and Borden Type II/III dural AVFs were 25.9 and 60.4 months (P = 0.028), respectively, and the median treatment to symptom-free durations were 10.6 and 36.7 months (P = 0.103), respectively [Figure 2]. One patient had a recurrent hemorrhage. Two patients experienced brain edema after SRS and one patient experienced cystic formation after GKRS. The morbidity rate was 19% (four of 21 patients) and there was no mortality. GKRS for dural AVFs has been shown to be effective in many studies ,,. In a recent systemic review  of 19 articles and 743 patients, the mean CO rate for dural AVFs after GKRS treatment was 63%. In our study, we had a CO rate of 47%. The short follow-up duration in the present study might have contributed to the inferior obliteration rate as endothelial proliferation in response to SRS might occur gradually. In one study, 41% of patients treated with SRS achieved CO after 21 months . Therefore, if we exclude patients with <6 months of follow-up from the present study, the CO rate was 53%. In addition, all 21 patients showed partial to complete symptom resolution, suggesting that SRS is effective in treating dural AVFs, especially with regard to symptom control. Borden Type II/III AVFs have cortical venous drainage and are considered to carry a higher risk of hemorrhage and inferior GKRS treatment response ,,,. Similar results were observed in our study. The CO rate for Borden Type I AVFs was 66.7% and that for Borden Type II/III AVFs was 25%, a nonsignificant difference (P = 0.153). Moreover, it took more time for Borden Type II/III AVFs to achieve CO (25.9 months for Borden Type I and 60.4 months for Borden Type II/III, P = 0.028). Only one patient who initially presented with hemorrhage in our study was classified as having Borden Type II AVFs in the transverse sinus. Although CO was not optimal after GKRS for Borden Type II/III dural AVFs, this treatment was effective in symptom resolution in both groups (76.9% complete symptom resolution for Borden Type I and 75.0% for Borden Type II/III, P = 1.000). In contrast, we found no difference in the CO rate between the CC fistula and non-CC fistula groups (66.7% vs. 62.5%, P = 1.000). Similar results were presented in another study . The results might indicate that indirect type CC fistulas are dural AVFs that occur in the cavernous sinus. Surgery for dural AVFs has been proven effective ,,. The evolving technique of endovascular embolism has been used both in combination with surgical treatment , and alone as a less invasive option. Recently, GKRS has been used to treat dural AVFs in combination with endovascular embolization ,,. Many have reported that GKRS alone is effective in treating dural AVFs, especially for controlling symptoms, and our experience showed the same results ,,. The major advantage of GKRS is that it is a relatively noninvasive procedure with a low risk of complications. However, the major concern with GKRS alone in treating dural AVFs is that it takes longer to achieve CO ,. In our study, the median GKRS to image-free duration was 44.9 months and the median GKRS to symptom-free duration was 14.3 months. Many patients had significant clinical improvement in symptoms despite images that showed remaining dural AVFs. [Figure 3] shows a patient who presented with chemosis and proptosis and had complete symptom relief 2 years after treatment. 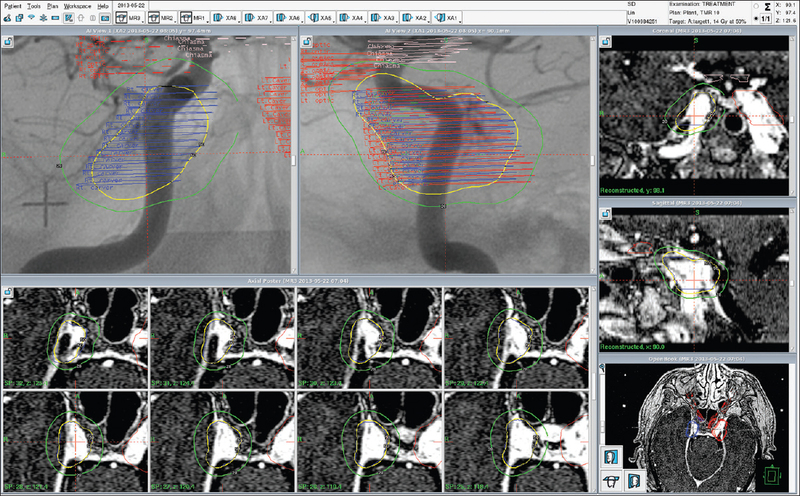 [Figure 4] shows a patient who had Borden Type II dural AVFs in the sigmoid and sagittal sinus and achieved CO after treatment. For Borden Type II/III AVFs, which carry a higher risk of cerebral hemorrhage, endovascular embolization combined with GKRS might be a better choice in terms of immediate reduction in the rate of hemorrhage and improvement of clinical symptoms. This combined approach could also achieve long-term CO .
Gamma knife surgery alone for the treatment of dural AVFs is effective and safe. Dural AVFs with cortical venous drainage (Borden Type II/III) require more time to achieve a treatment response, a factor that strongly influences the CO rate. However, the rate of complete symptom relief was equally good in Borden Type I and Borden Type II/III dural AVFs. Miller NR. Dural carotid-cavernous fistulas: Epidemiology, clinical presentation, and management. Neurosurg Clin N Am 2012;23:179-92. Ellis JA, Goldstein H, Connolly ES Jr., Meyers PM. Carotid-cavernous fistulas. Neurosurg Focus 2012;32:E9. Yang H, Kano H, Kondziolka D, Niranjan A, Flickinger JC, Horowitz MB, et al. Stereotactic radiosurgery with or without embolization for intracranial dural arteriovenous fistulas. Prog Neurol Surg 2010;27:195-204. Borden JA, Wu JK, Shucart WA. A proposed classification for spinal and cranial dural arteriovenous fistulous malformations and implications for treatment. J Neurosurg 1995;82:166-79. Cognard C, Gobin YP, Pierot L, Bailly AL, Houdart E, Casasco A, et al. Cerebral dural arteriovenous fistulas: Clinical and angiographic correlation with a revised classification of venous drainage. Radiology 1995;194:671-80. Chen CJ, Lee CC, Ding D, Starke RM, Chivukula S, Yen CP, et al. Stereotactic radiosurgery for intracranial dural arteriovenous fistulas: A systematic review. J Neurosurg 2015;122:353-62. Barrow DL, Spector RH, Braun IF, Landman JA, Tindall SC, Tindall GT. Classification and treatment of spontaneous carotid-cavernous sinus fistulas. J Neurosurg 1985;62:248-56. Pan DH, Chung WY, Guo WY, Wu HM, Liu KD, Shiau CY, et al. Stereotactic radiosurgery for the treatment of dural arteriovenous fistulas involving the transverse-sigmoid sinus. J Neurosurg 2002;96:823-9. Pan DH, Wu HM, Kuo YH, Chung WY, Lee CC, Guo WY. Intracranial dural arteriovenous fistulas: Natural history and rationale for treatment with stereotactic radiosurgery. Prog Neurol Surg 2013;27:176-94. Söderman M, Edner G, Ericson K, Karlsson B, Rähn T, Ulfarsson E, et al. Gamma knife surgery for dural arteriovenous shunts: 25 years of experience. J Neurosurg 2006;104:867-75. Oh JT, Chung SY, Lanzino G, Park KS, Kim SM, Park MS, et al. Intracranial dural arteriovenous fistulas: Clinical characteristics and management based on location and hemodynamics. J Cerebrovasc Endovasc Neurosurg 2012;14:192-202. Friedman JA, Pollock BE, Nichols DA, Gorman DA, Foote RL, Stafford SL. Results of combined stereotactic radiosurgery and transarterial embolization for dural arteriovenous fistulas of the transverse and sigmoid sinuses. J Neurosurg 2001;94:886-91. Söderman M, Pavic L, Edner G, Holmin S, Andersson T. Natural history of dural arteriovenous shunts. Stroke 2008;39:1735-9. Strom RG, Botros JA, Refai D, Moran CJ, Cross DT 3rd, Chicoine MR, et al. Cranial dural arteriovenous fistulae: Asymptomatic cortical venous drainage portends less aggressive clinical course. Neurosurgery 2009;64:241-7. Gross BA, Du R. The natural history of cerebral dural arteriovenous fistulae. Neurosurgery 2012;71:594-602. Mabuchi S, Nakagawa Y, Abe H, Kinomoto H, Tsuru M. Surgical management of arteriovenous malformations in the posterior fossa. No Shinkei Geka 1983;11:883-9. Malik GM, Pearce JE, Ausman JI, Mehta B. Dural arteriovenous malformations and intracranial hemorrhage. Neurosurgery 1984;15:332-9. Sundt TM Jr., Piepgras DG. The surgical approach to arteriovenous malformations of the lateral and sigmoid dural sinuses. J Neurosurg 1983;59:32-9. Barnwell SL, Halbach VV, Higashida RT, Hieshima G, Wilson CB. Complex dural arteriovenous fistulas. Results of combined endovascular and neurosurgical treatment in 16 patients. J Neurosurg 1989;71:352-8. Link MJ, Coffey RJ, Nichols DA, Gorman DA. The role of radiosurgery and particulate embolization in the treatment of dural arteriovenous fistulas. J Neurosurg 1996;84:804-9. Pan HC, Sun MH, Yang DY, Wang YC, Lee SD, Chen WH, et al. Multidisciplinary treatment of cavernous sinus dural arteriovenous fistulae with radiosurgery and embolization. J Clin Neurosci 2005;12:744-9. Chandler HC Jr., Friedman WA. Successful radiosurgical treatment of a dural arteriovenous malformation: Case report. Neurosurgery 1993;33:139-41. Lecavalier-Barsoum M, Roy D, Doucet R, Fortin B, Lambert C, Moumdjian R, et al. Long-term results of radiosurgery for cerebral arteriovenous malformations. Can J Neurol Sci 2013;40:182-6.